There’s a wonderful story behind the artwork featured in this book – what parts of it captured your imagination in the design process? Cruachan Power Station is located almost a mile beneath a reservoir on one of West Scotland’s highest mountains, Ben Cruachan. It was constructed between 1959 and 1965, and was the first reversible pump storage hydro system on this scale to be built in the world. It’s amazing to think of the scale and difficulty of such a project—the hardness of the rock, the conditions inside and outside the mountain, the epic scale of the very idea. All of this was inspiring to us. Cruachan was the brainchild of Sir Edward McColl, who came up with the concept in the 1930s. Over the course of the six years during which the station was under construction, there was a workforce of around 1300 men, affectionately known as the Tunnel Tigers. The men used hand-held air drills to bore holes in the solid granite rock, which were then packed with gelignite and blasted. 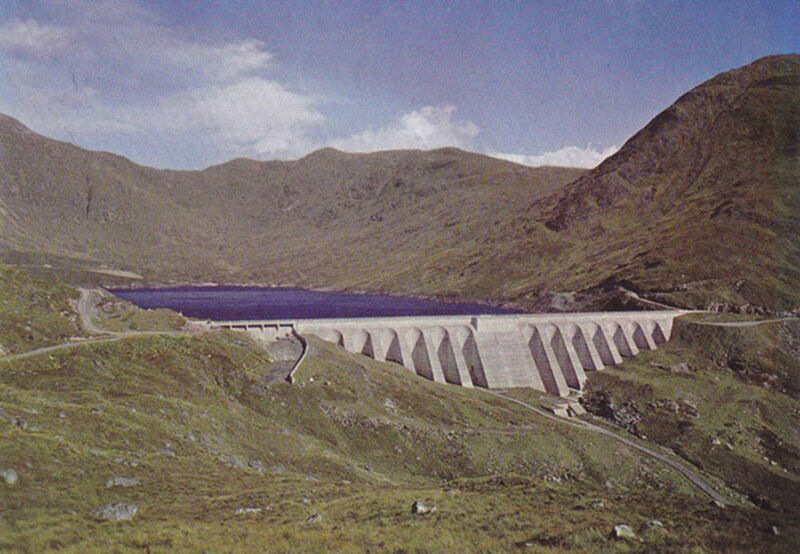 Cruachan Power Station was completed in 1965, and is still generating electricity today. 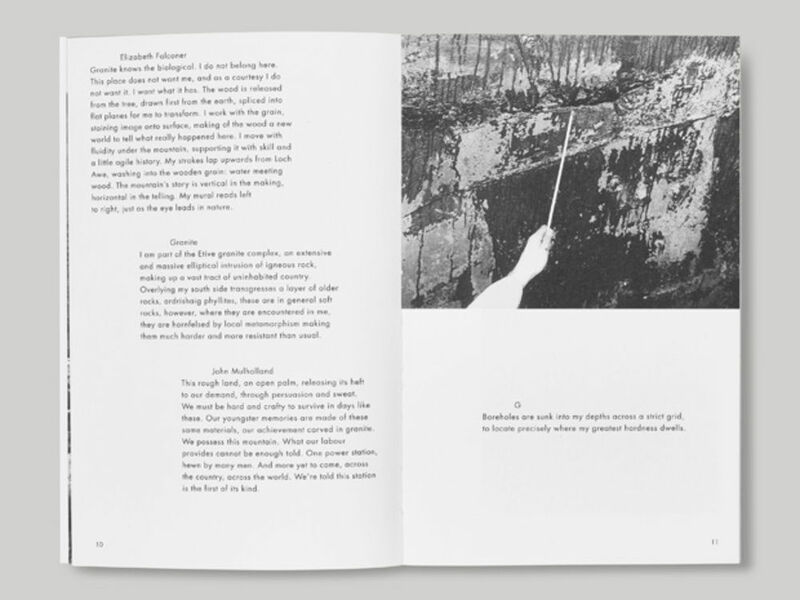 In writing the script and the story for Master Rock, Maria Fusco combined her original writing with archival materiality and topographical reportage to bring together geology, mythology and technology to tell the epic story of the hollowing out of the mountain during the creation of Cruachan Power Station. 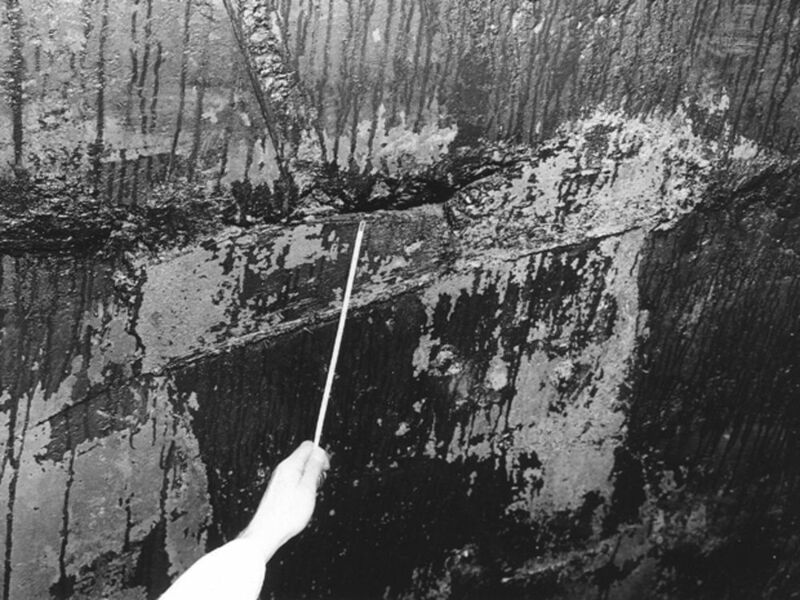 She created three fictional voices from her research: John Mullholland from the Tunnel tigers, the Irish explosives experts who emptied out the mountain to build the power station; Elizabeth Falconer, the amateur artist who created a marquetry mural inside that only the site’s workers ever see; and Granite, the 450 million year-old rock of Cruachan itself as a main character. The research materials that Maria had gathered were great: documentary photography of the construction, portraits of the tunnel tigers, geological maps... We worked closely with her to weave these into the texts. The contrast between these archival materials, and the legends told through Falconer’s mural, created an interesting dynamic. Were you able to visit the Ben Cruachan site? 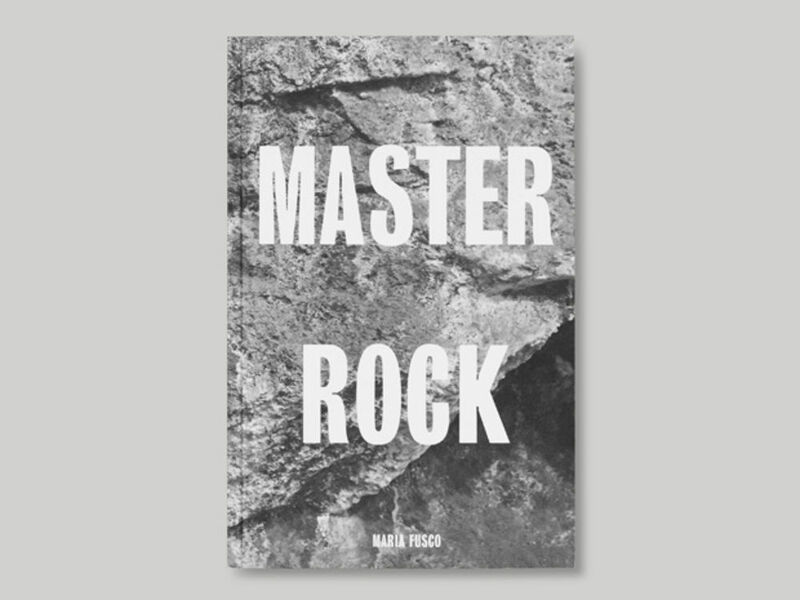 We were lucky to have the chance to visit for one of the performances of Master Rock. We met on a very wet and windy evening in the car park at Ben Cruachan, after driving a few hours from Edinburgh where we’d just been doing a lecture. A small number of us were taken in a minibus from the entrance and driven almost a mile into the centre of the mountain beneath the reservoir. As we were driving, it was amazing to think that this was actually hollowed out by a group of people in the early 1960s. The progress must have been so slow and painful—especially with the mountain being mostly granite, one of the hardest types of rock. On arrival, we stepped out and noticed immediately how hot it was. We took a short walk through the last part of the tunnel, which opened out into a vast cavernous space. We wandered around the huge turbines, and inspected the walls of buttons and dials—all of which are still functioning. 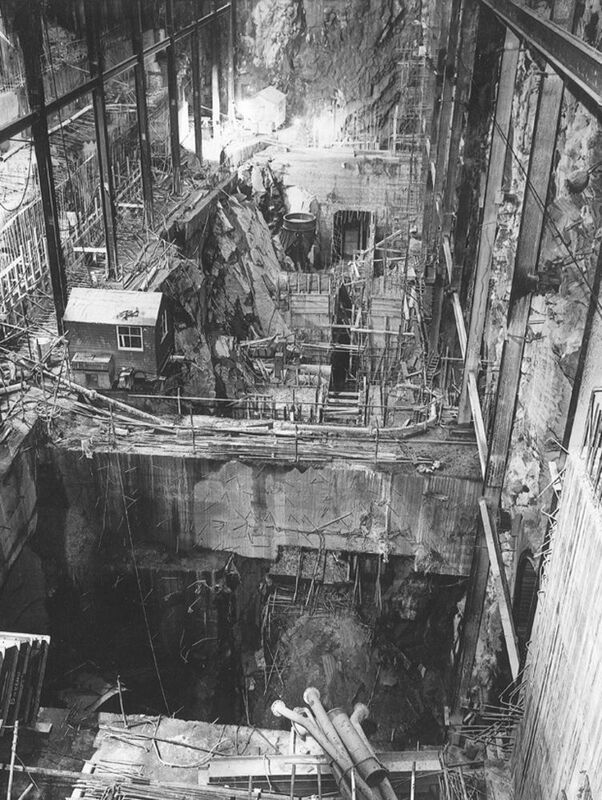 It was an amazing place, and the impression of being so far underground in a man-made space about a mile under the reservoir that we had passed by earlier was overwhelming. After fifteen minutes, the performance began. Sound was composed on-site by Olivier Pasquet together with three distinctive voices: Irish actor Lalor Roddy as John Mulholland; poet Denise Riley as Elizabeth Falconer; and musician Ceylan Hay as the voice of the ancient granite. 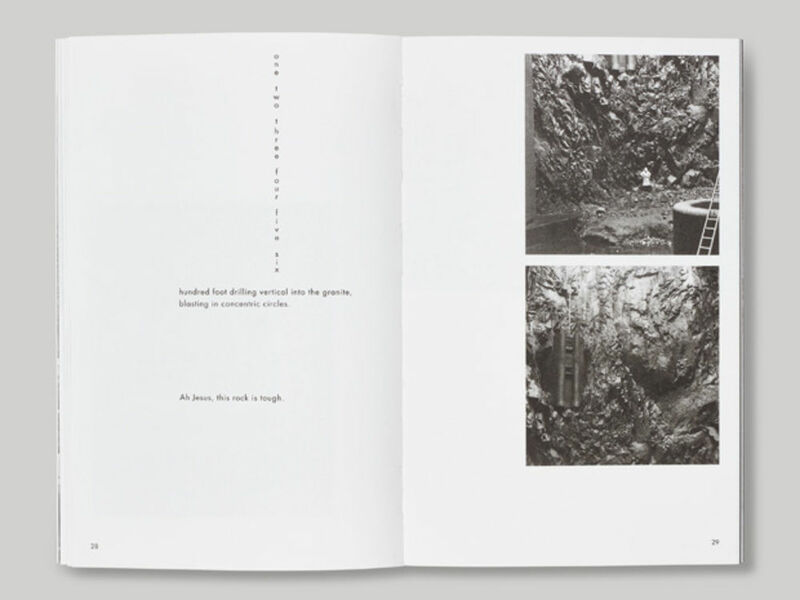 The book is based on Maria Fusco’s spoken word performances – were there any special design considerations for rendering the oral content typographically? 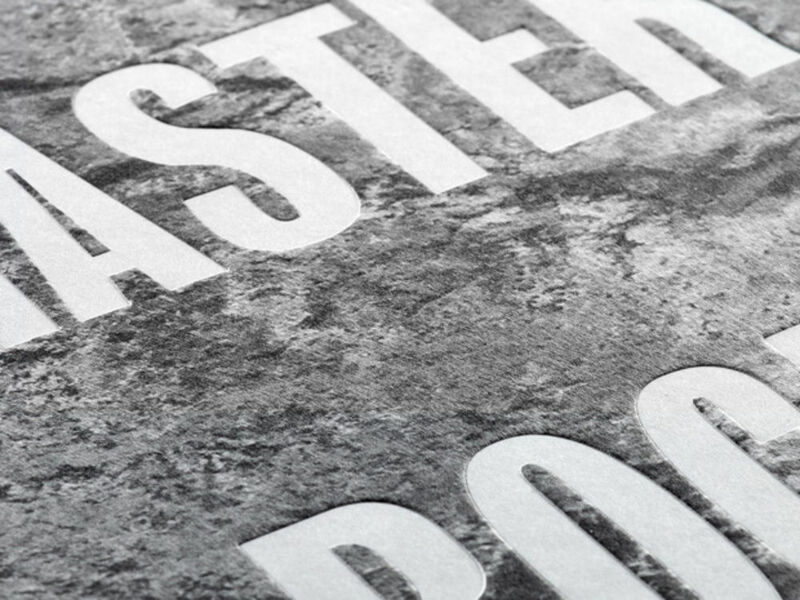 Whist designing the book, we always had in mind that the text was conceived for radio: it is a script, so the pauses and white space are as important as the text itself. The story comprises three voices, and in the book both text and image are treated like a voice of one of the characters. The position of the each of the voices on the page always comes in at the same point, whether it is words or images, which gives the an underlying rhythm and structure. On the cover, we designed the lettering as a direct response to the title of the book—a heavy grotesque typeface with exaggerated gaps chiselled into it. 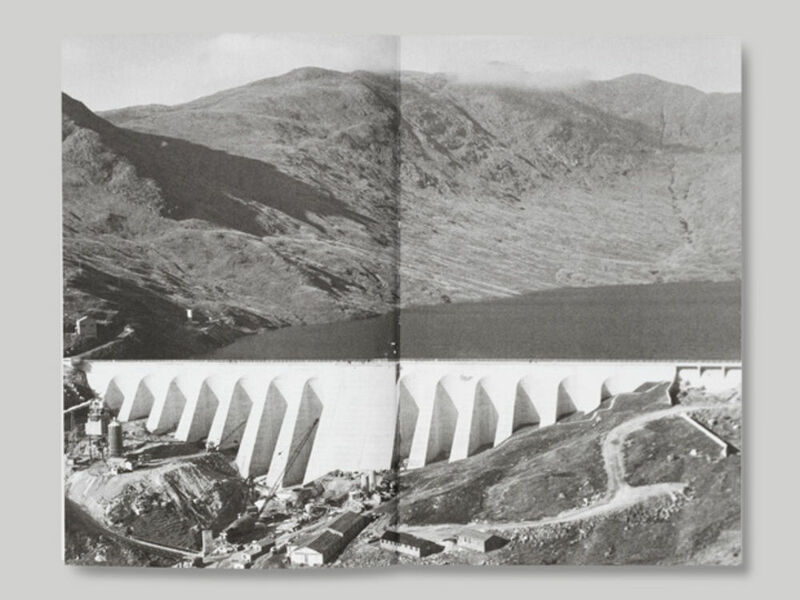 The typeface on the inside pages is Futura Book – we chose it because it echoed the old text books and information leaflets published around the time that the Cruachan Power Station was being built. It also works very well as short blocks of text, which the script required. 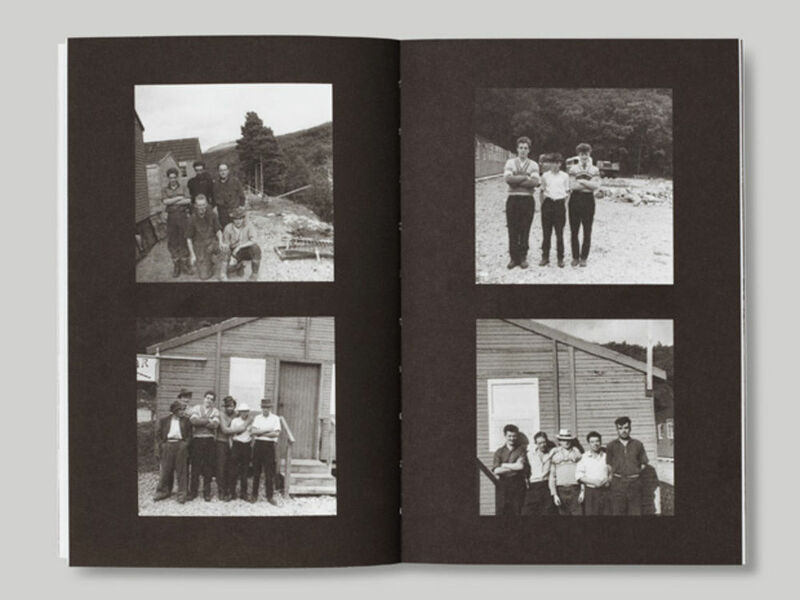 We printed the images in duotone—working with such a variety of images and image quality, and the fragmented structure of the script, it was a way to bring some continuity into the appearance of the book as a whole. It felt appropriate for the book to be small but strong as an object, so with the budget we saved by printing in only two colours, we were able to make the book hardback. It was finished with cut-flush edges, as this felt in keeping with the materiality of the rock, and in a small way, with the process of cutting into the rock face to create the power station. The paper we chose is Munken Print White 15—it’s rough to the touch, and bulky, but light enough to feel nice to read, like a novel paper. See more work by APFEL here. Find about more about Maria Fusco's work. 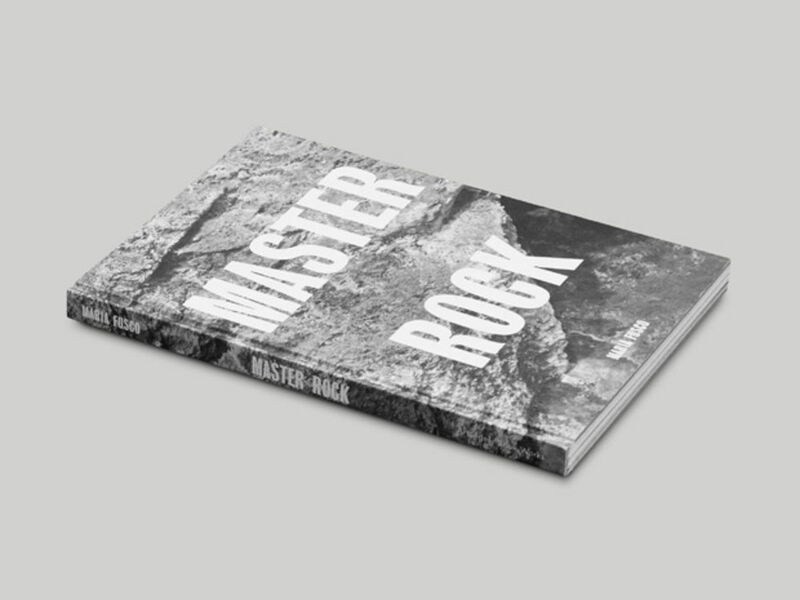 Listen to the Master Rock performance here.